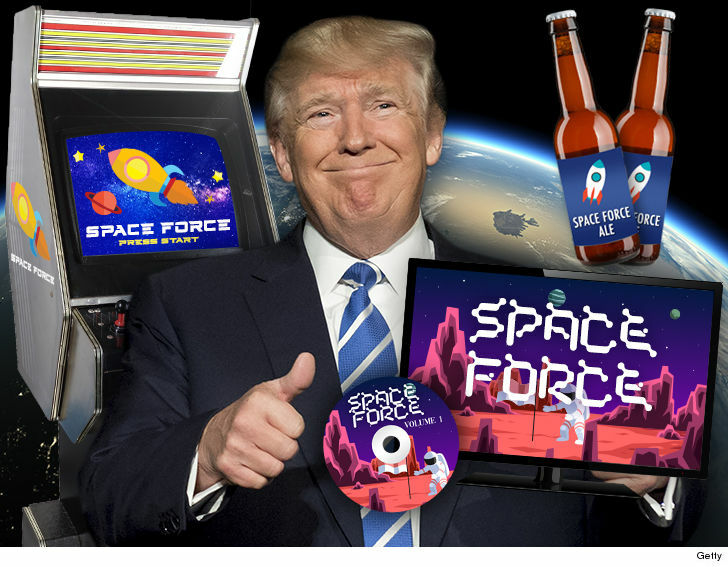 President Trump‘s plan for an upcoming U.S. Space Force isn’t just major news for the military … it could be a huge windfall for beer and computer game producers too. TMZ has learned the term “Space Force” has been quite popular, long before the Prez uttered the words for his proposed 6th branch of the military … by makers of an arcade game, among others, that trademarked it in the ’80s. That game fizzled out and the trademark expired but, years later in 2014 … a company filed paperwork for the rights to “SPACEFORCE” (one word) for online computer games and interactive educational games in the field of physics. According to the docs … they’ve had the trademark on lockdown since 2015. Then, after Trump first announced his Space Force idea in March, a shrewd business person jumped on the chance to own the rights to the name … for beer. According to legal docs, trademark paperwork for “Space Force” has also been filed as recently as June to make action figures and accessories. Obviously, if these trademarks go through, the owners are set to benefit from the name recognition of the government’s new military service … which Mike Pence says will be created by 2020. If this thing becomes a reality, these folks could really cash in. Trump’s officially ahead of the game on that one though.